Hans-Peter Porsche collects old tin—or, more precisely, model trains and toys produced over the past 150 years. And to house his treasures, he’s created a “dream factory”: the TraumWerk. A Perfectionist’s Passion. “Here, take a look at this typical ‘Crocodile,’ a Märklin replica of the famous locomotive. And the ships over there – each one more beautiful than the last – and everything so exact, right down to the last detail. Now that’s craftsmanship.” A very personable white-haired gentleman in a dark jacket and red tie with a bear pattern guides his guests through the exhibit. A gentleman with alert, sparkling eyes, who is always smiling. Each new toy exhibit fills him with enthusiasm from head to toe and brings yet another twinkle to his eyes. Hans-Peter Porsche is giving us a tour of his TraumWerk – a monumental world of toys that quite rightly deserves its name. The numbers alone are impressive: 27,000 square feet for the permanent exhibition of tin toys, nearly 6,000 square feet for the model railroad. The full range of the collector’s passion is on display in this space – over forty years in the making, though the toys languished in boxes for decades. Now Ferry Porsche’s son has built a museum for his collection, in the district of Berchtesgadener Land of southeastern Germany. 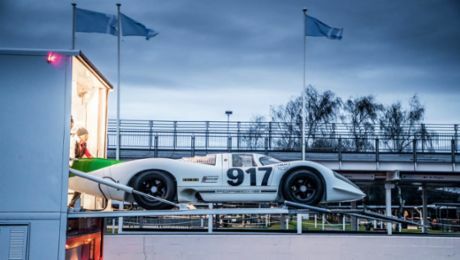 Porsche commissioned the Berlin architect Volker Staab to create an exhibition building with a circuit that would follow the outline of a figure eight – the classic shape of a small railroad installation or race-track. The first part of the tour takes visitors through the permanent exhibition of tin toys: one hundred and fifty display cases of innumerable railroad stations, cars, airplanes, ships, shops, trains, and much, much more. The second part invites people into the world of model trains. “Come on over here and take a look at this swimming pool from 1910, which I kept in my study at home. If you fill the pool with water and press that pump, the little shower actually works. That’s one of the highlights here at the TraumWerk.” Hunting trophies are what you might expect to see in a study. But not if that study belongs to Hans-Peter Porsche. “Such precision, even back then – this is what makes these toys so unique, in my opinion.” That is what appreciation for technical perfection sounds like. “All my life, I’ve tried to make things as perfect as possible. I’m a Scorpio, after all.” Not to mention the technology gene that the entire family seems to share, including the company founder’s grandsons. “Even as kids, my brothers and I loved to tinker. One Easter our mother asked us to dye the eggs. So my oldest brother, Ferdinand Alexander, built a machine from the Märklin construction set; I trimmed corks from canning jars, fixed the egg in place between the corks, installed a brush holder and gears, turned the crank – and voilà, the eggs were dyed. We weren’t even ten years old.” The TraumWerk seems to bring things together where they belong. One casualty of industrialization in the nineteenth century was the era of the wooden toy, replaced by its newfangled tin competitor. The tour of the exhibition takes visitors past submarines, ships, steam-engine plants, and automobiles. The exhibits depict every era and include pieces from select toy manufacturers from around the world. The oldest piece: a locomotive from 1865. Some exhibits, such as the thimble-sized tin barrel, are practically a bargain at $55. Others, such as the ship as large as a moving box, are worth as much as a single-family home. It goes without saying that car enthusiasts will also find plenty to enjoy in Mr. Porsche’s dream factory. The TraumWerk repository includes a fine selection from his personal collection: a Porsche 904; the Porsche 356 that made three appearances at the Liège–Rome–Liège rally; the problem child, a Porsche 959 (“It has to be driven every month; it doesn’t do well if it stands around too long”); an Austro-Daimler (“a gift from my son”); the one-liter XL1 from Volkswagen; a Porsche 914 Targa; a Porsche 944; a Porsche 928; and a pale blue Porsche 912 (“That car is very special. It was a Christmas gift for my mother in 1966. For the past twenty years, an Italian lady has owned it. But now I’ve been able to buy it back, and it’s in mint 1966 condition.”). Each exhibit in the collection has its own story to tell. You’ll find the most personal items in the display case at the end of the first-floor exhibition area, which includes a toy Mercedes that Hans-Peter Porsche painted as a child, a race car, a teddy bear – and his first bear-themed tie. “A friend of mine in Stuttgart sent it to me many years ago. I now have over six hundred bear ties in my collection. I’ve always collected things: I started off with coasters, moved on to matchboxes, then discovered swizzle sticks….” The ramp leads back down to the foyer. Porsche appears to be slightly restive. The pressure of another appointment? A lunch date? No, not at all. “Hurry everyone, it’s about to start!” Porsche nudges his guests in the direction of the second part of the exhibition: the world of model trains. “But watch out, you’re going to be photographed.” And in fact, as soon as you enter the room, a figure in the backdrop trips a flash aimed at the visitor aisle. We are now in the heart of the TraumWerk: a 4,000-square-foot landscape over 16 feet high. A piece of Europe in miniature: Austria, Switzerland, and Germany, including Lake Constance. In total one hundred and eighty trains, all from Porsche’s private collection. Forty of them are chugging along at the same time on nine separate tracks – a total of 1.7 miles of rail lines – while their companions are recuperating in 32 fiddle yards below the installation. Thirty model cars are en route. The skiers at Semmering Pass are not sliding down the mountain – “Well, not yet,” Porsche calls out. But then there’s the scene just to the right of the entrance. A hill along the lake. 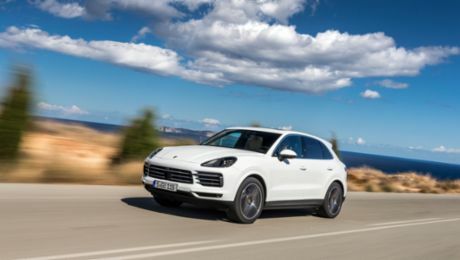 A white Porsche Cayenne is heading downward. It stops at the intersection, signals, turns in at a lakeside property, and stops again in front of the garage. The door opens, the Porsche drives inside, the door closes. Now it’s clear to the visitor what attention to technical details really means. There’s so much to discover: a raised dance floor in Salzburgerland; a pair of lovers in a secluded mountain spot (“Those rascals slipped that one past me”); the welding robots that shoot sparks at the Porsche plant in Zuffenhausen; Porsche’s grandfather’s house on Feuerbacher Weg in Stuttgart, where the first VW Beetle came to life; and even the host of the TraumWerk himself, standing on a lakefront and gazing at distant shores. Four technicians and a modeler monitor the sixteen computers in the control room. A model train specialist from the Mainz area and his team built the exhibit over a period of two years, using original plans and photographs to reconstruct the houses and railroad stations. Hans-Peter Porsche glued a number of the trees himself – though not every one, since there are 80,000 in all – and his son soldered the wiring. The installation was then broken down into modules weighing 650 to 900 pounds each and sent to the small town of Anger, where it was reassembled. Tuesday through Sunday, 9:00 a.m. to 5:30 p.m.
Porsche presents four world premieres at 77th Goodwood Members Meeting in Great Britain.